According to Tibetan Medicine, one of the world’s oldest healing traditions, the human body is composed of three forces (nyepas) that are responsible for mental and physical well-being. Everyone is born with a predominance of one or more of these forces or energies, referred to as the person’s constitution. Knowing your constitution and achieving a balance of the three nyepas ensures good health. Yangdron Kalzang, Doctor of Tibetan Medicine, will provide a brief introduction to the fundamental principles of Tibetan Medicine and the energies which determine our mental and physical health. Students will take a short questionnaire to help them determine their constitution and will learn about the different factors which affect it. Finally, students will learn how to modify their diet and behavior to achieve more balance and a better state of health. Yangdron Kalzang is the founder and Director of the Tibetan Wellness and Healing Center in Daly City. 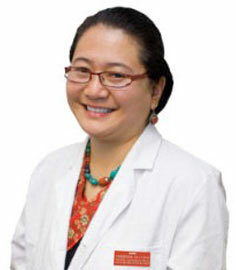 Mempa (doctor in Tibetan) Kalzang earned her Tibetan Medicine Degree from the Tibetan Medical University in Lhasa, Tibet and her Masters Degree in Traditional Chinese Medicine from Five Branches University, Santa Cruz. A California licensed acupuncturist, she helped develop the curriculum for the Shang Shung Institute School of Tibetan Medicine in Massachusetts. Mempa Kalzang has taught Tibetan Medicine in a variety of settings including the University of California, San Francisco and Stanford University. Note: Mempa Kalzang will be available to conduct brief, informal consults with students from 2:30pm – 4:00pm. Individual offerings for these consults can be made directly to Mempa Kalzang.